Bahaa-el-din said the video was captured in one of Gabon’s better-managed logging concessions: an area leased to a logging company. After she and a field assistant spent three weeks prospecting the area, they set 40 sets of still-camera traps, each activated by motion, and returned to collect photos roughly every two weeks for a seven-week period. After photos showed that a golden cat was getting close to one camera, she decided to set a video camera at that station. 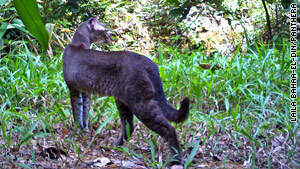 Days later, she had several clips of an African golden cat walking and lounging during the day and one at night, chasing what appeared to be a bat. Bahaa-el-din will survey three more areas through 2012: a more loosely managed logging area; an area where humans hunt; and pristine forest. Besides taking photos, the team is checking waste from golden cats and leopards to determine what those animals are eating and whether humans’ hunting of leopard prey is forcing leopards to compete with golden cats for food. The data could show whether golden cats thrive better in better-managed logging area than loosely managed ones and whether different hunting regulations would be useful, Bahaa-el-din and Hunter said. The golden cat is so shy and limited to deep forests, people rarely get glimpses of them in the wild, let alone snap pictures. Thus the animal has hardly been studied, said Hunter and Bahaa-el-din, who is registered with South Africa’s University of KwaZulu-Natal, in partnership with the University of Oxford’s Wildlife Conservation Research Unit. And the survey may challenge at least one belief about the animal. The International Union for Conservation of Nature says that although there are no reliable density estimates, the world's population of mature golden cats probably exceeded 10,000 in 2007. Several experts of African wildlife said the Panthera video is very rare. One, Tom Butynski, director of Saudi Arabia’s King Khalid Wildlife Research Center, said he has seen one video of an African golden cat in the wild, taken in March in Kenya. That video, however, doesn’t appear to be in the public domain. On the Internet, ARKive has a clip of an African golden cat, but it was taken in captivity in Germany in 1976, ARKive personnel say. 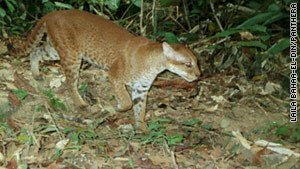 Panthera says it knows of no African golden cat in captivity today. Let's hope no one else finds these elusive cats or they will be poached and driven to extinction. Yes Carol that is my biggest worry too 😦 May this cat stay far from the hands that would exploit it, including the 'scientific' ones ! The best thing is that conservationists could trace them and work to protect them. The wrong thing was showing the location where this cat was filmed! They are already increasingly getting rarer in west africa, like almost all wildlife there, and making their location known to every one out there is just wrong. Sure, there are a few poached cats here abd there. But most cats are captured and forced to learn how to sh/t in a box. Now if someone would just invent a furr-ball spitoon. Fantastic Laila! Very well done. Toys?? Heck no. My cats get wads of crinkly paper, Q-Tips and any roach, moth or lizard that finds its way to its death by kitty. Cost? Pretty much ZERO.